In late 2017, Obsidian announced that it was developing a new RPG that would be published by Private Division, a label of 2K Games designed to fund mid-sized games. The companies did not say anything about which consoles the RPG will be available on, and it’s not clear how this sale will affect that game. One option is for Microsoft to buy out the contract; another is for Microsoft to simply inherit it, allowing Obsidian to tie up its loose ends as part of the acquisition. “While it is our policy not to comment on rumors or speculation, we look forward to publishing the upcoming RPG from Obsidian Entertainment, and remain confident in the team there to deliver an outstanding game,” said a representative for Private Division. This would be a huge move for the company behind Xbox, which has been on a shopping spree this year, snapping up four game studios including Playground (Forza Horizon) and Ninja Theory (Hellblade). Its most recent notable game studio purchase before that was Mojang, the maker of Minecraft. Microsoft has kept Minecraft multiplatform, even enabling cross-play between Switch and Xbox One players, but console makers usually buy studios with the intent for those studios to make games for their consoles, not the competition. Microsoft’s biggest weakness this generation has been its stable of first-party developers, and with Obsidian, the company now has an RPG-focused studio that can help it compete against the PlayStation’s strong lineup. 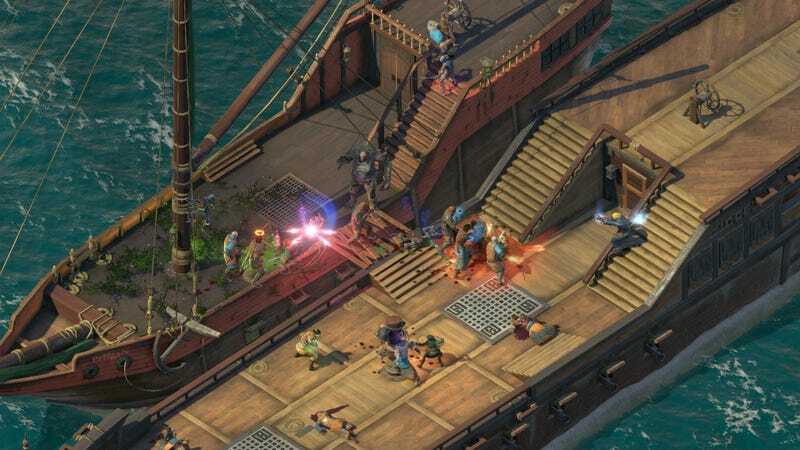 A person familiar with goings-on at Microsoft said the company has been looking to bolster its PC development, which makes the PC-focused Obsidian a perfect fit. Obsidian and Microsoft have a checkered history. Before the release of the Xbox One, Obsidian was working on an Xbox-exclusive role-playing game, published by Microsoft, called Stormlands. Tense disagreements between the two companies led Microsoft to cancel the game in 2012, and to some involved it was hard to imagine the pair working together again. The Xbox department is under different leadership now, however, with Phil Spencer taking the top role in early 2014. And the move appears to make sense for both parties.